Everyone loves shocking Apple news, and today, we have it -- admittedly, not in the sense you might be thinking. You know those white earbuds everyone and their mother wears these days? The ones that let you rock out with your... uh, iPod out? Apple now says they could shock you. Literally. The Apple earbud warning comes via an Apple knowledge base article (TS2729) modified on Monday. 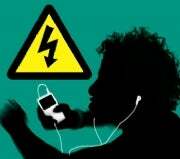 "It's possible to receive a small and quick electrical (static) shock from your earbuds while listening to [an] iPod or iPhone," the page states. "For users actively listening to Slipknot, the experience may be deemed 'awesome,'" it probably should continue. In all seriousness, though, the shock is a simple result of static electricity: A charge builds up and becomes concentrated in the earbuds. Then, at some point, it reaches its threshold and discharges by sending you a quick zap. It's kind of like the slide-your-feet-and-shock-someone phenomenon, as Apple explains, only with the energy concentrated in the device instead of in your body. So what's a music listener to do? Fear not, earbud fans: Apple has some tips to keep your shock level low. • Don't use your earbuds in "dry environments." Also don't misinterpret this and take them into the pool. • Avoid touching a grounded and unpainted metal object before sticking the buds in your ears. Well, damn -- there go my plans for doing handstands on a construction site while enjoying the smooth sounds of Yanni's "Optimystique." • Spray some anti-static spray into the air before starting up your iPod. This has the added bonus of causing everyone in the room to clear away from you. • Try wearing different clothes. Seriously -- that one is exactly what Apple suggests, word-for-word. The iPhone team recommends natural fibers instead of synthetic fibers. And here you thought you had to turn to Ralph Lauren for fashion advice. • Keep the device in your pocket as much as possible, as rubbing it "on certain materials" too much can cause a charge to build up. Wait... what are we talking about, again? • Finally, use an "anti-static hand lotion." I swear to you I'm not making this stuff up. And I'm not even going to go there with this one, either. I'll just say this: You're welcome.